If you are moving to or from Santa Fe, New Mexico, you will need an experienced moving service to make your experience efficient and simple. Whether it’s a residential move or office relocation, our moving service specialists at Pratt Van Lines can help you pack, move, and unpack all of your belongings as stress-free as possible. When moving your family to a new residence, it is important that you employ a moving company with exceptional service and excellent training. At Pratt Van Lines, our Santa Fe moving experts are committed to providing each of our clients with Gold Star Service to ensure your happiness. Call 505-250-3949 today to discuss all of our moving services! For all of your residential relocation needs, Pratt Van Lines can help you move your belongings in the most stress-free, efficient way possible. Whether you as an individual are relocating for a new job or your company is moving to a new location, Pratt Van Lines can help. Our comprehensive moving services allow you to take care of your company’s business while we pack, move, and unpack everything in your office. All of our Santa Fe moving experts have the training and experience needed to safely and efficiently transport your office’s supplies. At Pratt Van Lines, we guarantee the best possible service during your residence or office relocation in Santa Fe, New Mexico. From packing and unpacking services to custom packaging and crating, we work to ensure your satisfaction and happiness while moving. 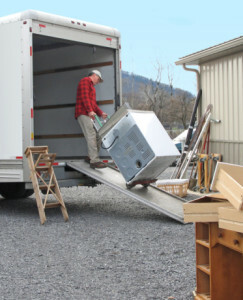 Contact our Santa Fe moving company for a FREE quote on your upcoming move.